You are here: Home>Archive>Taylor Brown Collection.>Marriages.>Letter from Betty Colquhoun. Handwritten letter from Mrs. Betty Colquhoun sending a copy of a photograph of Frank Brown’s wedding. 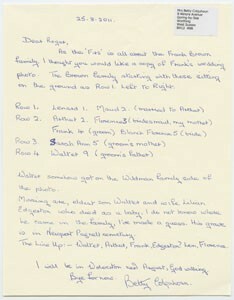 The letter is to Roger and explains who the people in the photograph are. The letter is on cream writing paper with an address label stuck at the top right hand corner. It is dated 25.8.2011 and is written in blue ink.